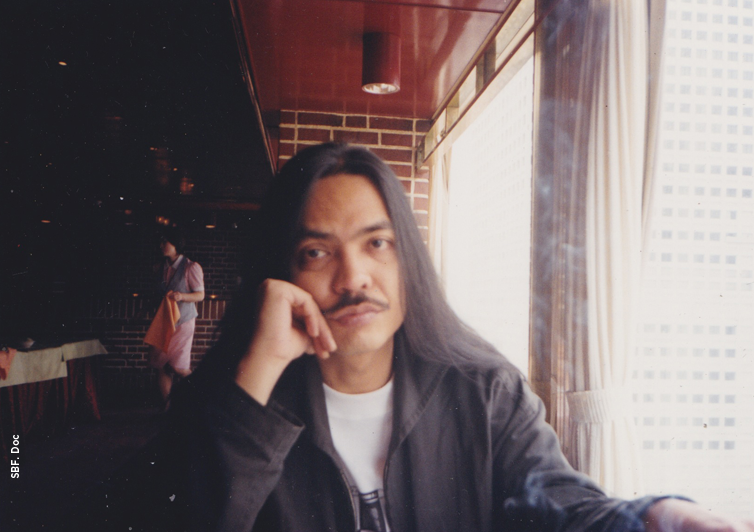 Foreword from Serrano G. Sianturi (1960-2019) | with a slight adjustment. Music can either be a remnant from our past or an attempt to answer our present and future challenges. While science and technology keep on progressing and reach a new level, the way we view and live our lives are prone to disruptions. Change has become a debatable arena. Some resist, others compromise, and the rest completely embrace the new ways. Arts reflect and address such reactions, and eventually find their new forms that suit the context. Throughout the history of humankind, individuals within societies have always come to a consensus on how to convey their lives. Such concord shapes people’s views and thoughts then lays the common platform to respond to current and future challenges through art, science and technology. We are already approaching the end of the second decade of the 21st century, and yet societies and nations around the world have not come up with viable and amenable thought and platform in facing the current technological, economic, political and cultural changes. None is certain whether we ever reach a common and global attempt, directives and solidarity to take on the 21st century. In 2018, our sister web, Vox de Cultura, had an opportunity to interview a young experimental composer, turntablist, and electronic music artist who has been responding to her surroundings, may it be social, political, technological or cultural. Her exploration has gone beyond her Classical music training at the Royal College of Music; she has “re-visited” the ideas about musical instrument, sound, and composition. Her name is Shiva Feshareki, a British of Iranian heritage. She is the recipient of BASCA British Composer Award for Innovation, and “The Composer’s Fund” PRS for Music Foundation. In 2018, she performed across Europe including at the Moscow Museum of Modern Art (VAC), BBC Proms and London Jazz Festival. She is also a radio presenter at NTS in London, UK. Thanks to Shiva Feshareki who gives the permission, Listen to the World had a chance to transcribe and re-publish the interview. It’s an important interview not only for Listen to the World, but also for the parent organization, Sacred Bridge, because it represents the very spirit of regeneration as well as corresponds to what Sacred Bridge is focusing on – Environment. Alongside Shiva Feshareki, the interview involved individuals coming from a variety of backgrounds; Christopher Roberts, one of LttW’s UK correspondent and Tri Prasetyaningtyas (Tyas), an Indonesian dance school teacher of Namarina Dance Academy. Vox de Cultura (Gerry): Hi everybody, I’m Gerry [and.Ed] I’m going to be the interviewer for today. Hi, Shiva, how are you? Do you mind introducing yourself, like what do you do, what kind of music do you play? 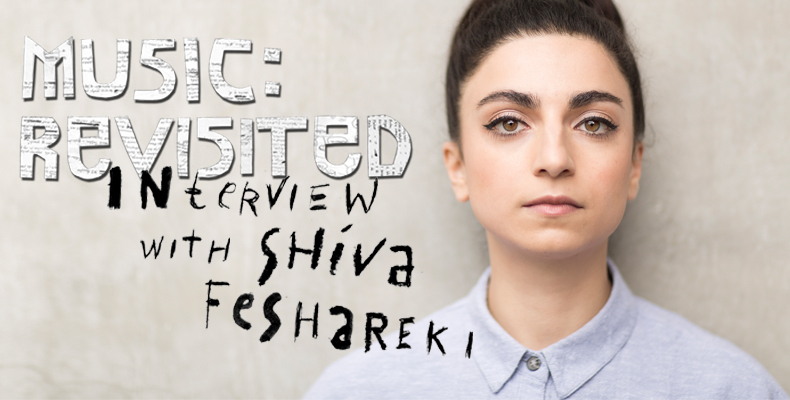 Shiva Feshareki: So, my name is Shiva Feshareki, obviously, and I’m an experimental classical composer. So, I guess I’m experimental in the sense that I try and reshape and redefine everything I do, so I’m trying to find a new perspective to the one I have now. And I’m classical in the sense that I have been classically trained so I use that sort of meticulous training to work on my experimentation. And my experimentation goes across genres as well, from classical music to improvisation with dance music producers, jazz musicians, etc. So, yeah, I work very collaboratively across different disciplines and genres in order to collect new perspectives, really. So, what got you into the music in the beginning? I think I was just always interested in sounds from the word go. I think as a child I’m always trying to make sounds with different household objects around the house. I played a lot of keyboard…we have the keyboard. And then once I was in secondary school, so in high school, I really got into composition when we started learning about it for our GCSC (General Certificate of Secondary Education. Ed), so that’s what you do when you’re 15 and 16. Since then I’ve just continued composing. What about the sounds? Do you like the character of the sound, the timbre? …I am really interested in the physicality of sounds; how sound interacts with other physical phenomenon such as with light, space it’s in, and even gravity. Yea, I think with sounds, I am really interested in the physicality of sounds; how sound interacts with other physical phenomenon such as with light, space it’s in, and even gravity. So for me, sound is about a bigger picture of how we exist physically. For example, as a car motor slows down and the movement of the car slows down you hear the pitch of the motor, descend and get lower. That’s the sort of sound I’m interested in. Sounds that relate to other things, everyday things. I know this sounds like a cliché, but I genuinely listen to all sorts of music from club and dance music to classical and folk music. I really love the music that comes from the early ages of electronic music, when electricity was first being used in music. I think the music being made then was really exciting because it’s almost like this new form had been invented. They were working with synthesized sounds instead of natural sounds and were free to make some really radical experimentations. A lot of music I like comes from the 50’s and 60’s, from the avant-garde composers who were working with the first forms of sound synthesis. What about avant-garde that you like? I think I just like the experimentation. Those are time especially in western cultures, especially maybe even in America where composers were working a lot with electronics and acoustics together in a really experimental way, such as James Tenney, [Iannis. Ed] Xenakis, Éliane Radigue and Daphne Oram. So, yea, I’m just interested in the experimentation and moving out of one perspective and gaining another one. Turntables have played a massive role in my compositional practice since I started composing more or less. I became fascinated just seeing DJs work with turntables. But then I got more fascinated in a different way by them, and started composing music for turntables in acoustic instruments. The reason that first I like turntables was because I could manipulate electronically acoustic sounds and do it quite intuitive manners. 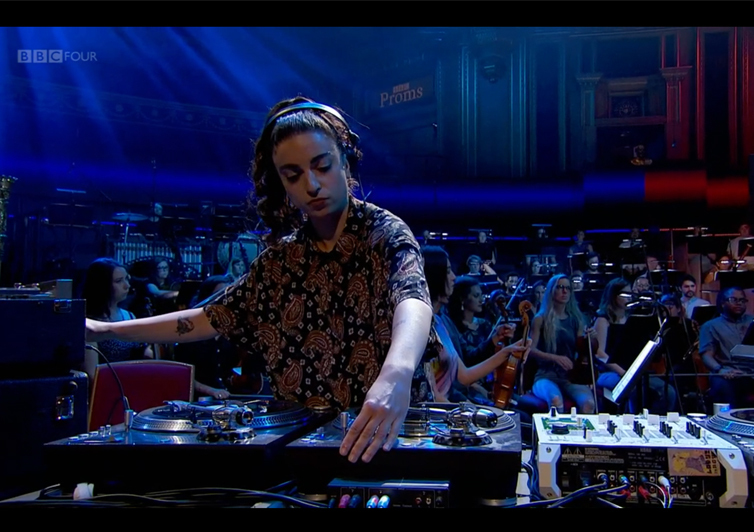 Because you’re not clicking buttons on computer screen, but you’re moving the turntables in quite specific way, manipulating sounds quite musically and intuitively with other instrumentalists. As my turntabling practice progressed over the years – I’ve been doing it for about 10 – 12 years now – but as it progressed now for me it’s more about the movement of the turntables themselves as the record spins. It’s about how I manipulate the sounds based on the speed which the record is spinning; are they spinning backwards, forward, slowing down and speeding up. So I work with again very physical movement in order to make my musical choices with my turntables. I do a formal scratching, but I don’t actually take much influence from Hip Hop “turntablism”. It’s more I just made up my own techniques as I improvise. The more I improvise the more new techniques I found that I wanted to use with my turntables. So, it’s a very tailor-made technique to myself. You wrote your own notation for the turntables when you collaborate with people. Do you come up with that yourself or how does that work? So, now any music that I compose and perform using my turntables, the basis is no longer notation but the physical circular movement of the turntables. As I’m classically trained I do a lot of orchestration and musical notation. That’s first when I work with turntable, when the first piece I wrote is a turntable concerto. And for that I notated the turntable parts, very similar to where I might notate for percussion or piano parts. And that works in interaction with the full orchestra. However, as my practice has developed I no longer notate the music because I think having a visual score takes away from the physicality of the turntabling. So, now any music that I compose and perform using my turntables, the basis is no longer notation but the physical circular movement of the turntables. I’m using motion and dance to make my musical choices rather than following my musical score. At first I used to have a conventional notation, sometimes graphic notation, but now I just have that physical feeling of playing turntables. Because we were wondering you collaborated with Haroon Mirza recently. How did you manage that? A lot of the time when you’re experimenting it can be the other extreme way where you’re just sort of like “Wow, I think I’ve just tapped into a brand new perspective for me as an artist” and then you grow with that new perspective and it feeds into the rest of your projects. So, that’s one of the reason I love collaborating because I’m always working with people who come from different cultures, genres, ways of thinking, and personalities. And by working together perhaps through improvisation or collaboration I learn a new perspective and new way of working. For example, when I work with Haroon Mirza, he’s an installation artist, I learned a lot about using space rather than just time. So, it’s about thinking of sound is occupying a space rather than just that linear movement in time and duration. And then when I worked with Kit Downes, he’s a brilliant Jazz pianist and also organist, we did a lot of improvisations together with turntables and organs. I learned a lot about free improvisation by working with him because I felt so much trust, faith and freedom in his existence. An improvisation piece by Shiva Feshareki and Kit Downes, performed at St. John at Hackney in London. (An audio excerpt from the original interview). Have you ever been criticized by anybody for doing these experimentations (whether from classical musicians or from people outside)? Yea, all the time. I mean, I think with anything that has some sort of impact you get both positive and negative feedback. I do find one thing that does happen a lot is that everyone has something to say about my music. I mean you can’t call yourself an experimental artist if everything you do turns out to be brilliant or everything you do is well received by the general public. Because in order to experiment you have to have some areas that don’t work and some areas that do, because you’re not really experimenting unless those issues occur like ‘Well, that didn’t work at all.’ That’s the learning experience. You use that to develop yourself artistically. And then, you move onwards and upwards from there. We’re very curious about this, actually. Mas Chris, what do you think when you listened to Shiva’s music? Because almost all of us here, when we listen to Shiva’s music, we needed some kind of instructions. Chris Roberts: Hello, my name is Christopher Roberts. I’m half English half Indonesian. I’m not a composer or anything like that, unfortunately. But I have been blessed to have lived in many different countries and experienced many different cultures throughout my life, which have allowed me to have a unique perspective of how I perceive my environment and the world. From my first opinion, when I’ve been introduced to any type of music – it doesn’t matter what style, what genre – whether it’s something I’d be interested in or not, I don’t like to perceive things as I need a manual to understand it. I like to listen to it and I allow the music to create how I feel about it. Because there are several types of music, there are always factors in a genre or in a song that you won’t necessarily like, but there is always be other factors that you will like, if you know what I mean. That’s why I’m a big fan of classical and electronic music, especially electronic music because if you are to break down electronic music and you want to just take one sound, that sound doesn’t sound very nice; but when add all these layers of sounds together, it creates a completely different feeling. Just like sound and music and art, it’s all perspective and perception. The sounds, if you’re talking about, if you were to relate it to English for example, I’ll say the sounds that she creates in her music, they’re kind of like metaphors. But instead of metaphor in written form, it’s more in a sound form, right? As I’m going back to…we all have our individual experiences and perceptions in things. And yea…I guess…Shiva expresses herself how she feels through the sounds. And she’s getting across how she feels but at the same time she allows anyone else is listening to her music, to have their own perception of it. And if it happens to link then it’s an amazing thing because you can get connected. But if it doesn’t, it’s also an amazing thing because it gets more perspective and more possibilities. Because we have our own way of expressing ourselves, right? You have…Shiva through music, you can have an artist through painting, you can have poet through words. But the underlining fact is the perspective and self-expression and the feeling and meaning behind it. Well actually, Tyas here has a question for you. Tyas: Hi, Shiva. I have a question for you regarding your profession as a composer and experimental musician. Have you got any critiques or can you share your ups and downs? Because as far as I know, nowadays there aren’t many women exploring serious music. Shiva: I’ve had a wide variety of experiences because of the nature of the music I write. It both includes a lot of technology and it includes a lot of experimentation. I think especially I do live stream performances, overall it’s extremely positive but I think you do get one or two people who want to objectify you because you’re a woman and they won’t necessarily do that if you’re a man. But there’s really easy ways to push them out of the picture. You only give attention to people who are interested in the music itself. So, if there’s a live stream going and then this conversation is occurring I’ll often happily converse with people who are asking me and say, “How did you make that sound?” then I’ll let them know. But if there’s someone trolling, you know, they get pushed out of the picture quite quickly. But I have noticed as a woman in this field you do get a lot of – especially in electronic music, DJ-ing and production – you do get a fair few discriminatory comments. But you just find ways of pushing them out of the picture, there’s ways of doing that. It’s a minority of people who are like that and you just push them out of the picture. Tyas: About your identity, do you consider yourself as British or do you have other roots? Shiva: I was born in London. I was brought up here, but I’m Iranian. That’s my heritage. So, I’m Persian. Yes, that’s my background. When you have a heritage, a cultural heritage that’s different to the culture that you live in, you have two perspectives on culture, two very deep perspectives on culture and that affects me as an artist a hundred percent. Just being able to compare and to contrast Iranian cultures and mannerisms with English ones in London, you just become more observant of picking up on culture when you have a background that is different to where you are also brought up. Vox de Cultura (Gerry): I think it’s really difficult, at least in my opinion, to talk about Iran and not talk about politics. Do you let that affect you in anyway? The whole politics with Iran and the US, stuff like that? As a composer, it makes me want to find ways of showing what we all have in common. Shiva: As a composer, it makes me want to find ways of showing what we all have in common. What I try and do instead is by using sounds that make sense to everybody using the physicality of sound. You know, everybody knows what the wind sounds like when it rustles in the trees. Everybody knows what bird’s songs sounds like. Everybody knows what the sound of thunder and lightning is. So, if I’m working with the physicality of sounds and being always inspired by everyday sounds, I feel like that’s my way of giving a political message that we are all in fact humans that experience the same things. That’s my way of being political is showing through my music what we all have in common. Just the physics of sounds and then where that could take us spiritually and metaphysically as well. Do you see yourself being socially responsible as well? Because you’re involved in community developments as well, from what I know. Well, I do a lot of internet radio work. First of all I think the people who follow my music especially on Facebook come from a variety of backgrounds and cultures. But one thing that I guess I have done socially is…because it means a lot to me, I’ve taken a lot of inspiration by the female pioneers of electronic music who were composing in the 20th century and a lot of them were quite unknown due to the social barriers and now through my DJ-ing I try and promote their work and…yea. I think the best I can do as a musician, like I said before is to try and find the fundamental sounds that we all share and then work with that to create my music. Which is what I’m doing with my orchestral piece I’m writing in the moment. What about music education? Because you do have some workshops for younger people. Can you tell us about that, what’s your motivation? My motivation is that I just think education is the most important thing. Education could mean many things, it has many different concepts. One of the biggest questions in classical music is – What’s 21st century music, what’s the next thing? I think if I thought about it too much, it would inhibit me being free. I think…the best I can do as a composer is to communicate and express what’s real and honest to me. And if that relates to other people that’s what I’m looking for. But the best I can do is to present what I have and then other people…they will either relate to it or not. I think a 21st century music…I don’t know the direction it’s going in, but I do feel like you have to be aware of the broader relevance of modern society, definitely, when you’re composing. That’s the one thing I can do. We heard that you like Indonesian music. Is that true? Yeah, a lot. I mean…a friend of mine[Ed] actually introduced me to the Kecak a few months ago, which I found really inspiring. Just that idea of the sounds and the chants being passed around, and then as the flow increases you move from the physical to the metaphysical. And I just got really inspired by it and there’s actually a section of my orchestral piece which I called ‘The Kecak’ and it’s just all the orchestral instruments. Chanting in a way, but using instruments. I was really inspired, really inspired. I recorded a brilliant instrumentalist Cathy Eastburn. She was creating a gong bath using different bronze instruments, chimes, and various other acoustic instruments. I recorded that and then manipulated it at a later stage using my turntables and the movement of my turntables. And I thought just it would be a good piece of radio, who knows…for taking you on a meditative journey and accessible to everybody online. And a bonus track from Shiva Feshareki. 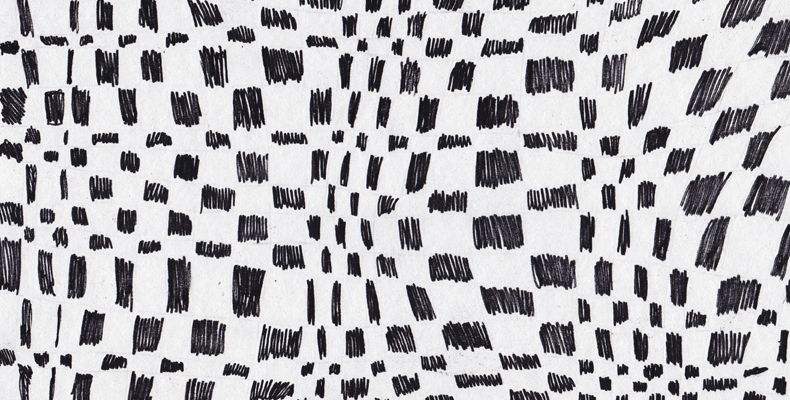 NEWFORMS – Evolution Loop. 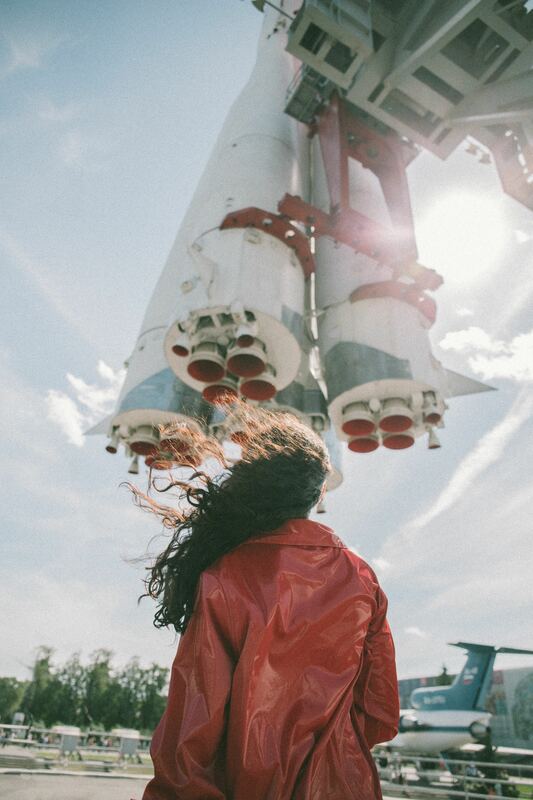 NEW FORMS is a debut album of Shiva Feshareki. 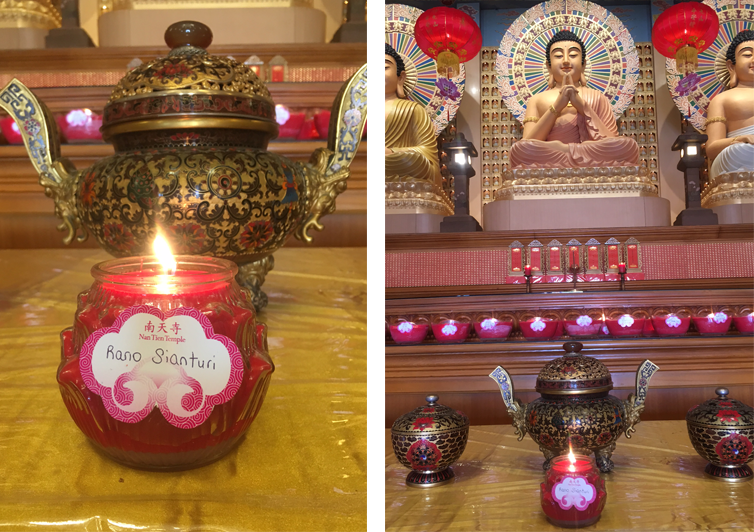 [Jakarta, LTTW] Serrano Gara Sianturi, founder and chairman of Sacred Bridge, passed away on January 26, 2019 at the age of 58. He is survived by his wife and two sons. He was known to many as an economist, engineer and mentor. He was an intellect. Admirably, as one of the key figures of Sacred Bridge, Rano never worked a day in his life for the sake of acknowledgement. What’s most important is that all that he had done was for the betterment of humanity as it will eventually return to self; not forgetting to pave the way for the next generations to continue the journey to shape their future. That was his drive in Sacred Bridge; a foundation that focuses on culture with humanity as the ultimate purpose. Together with his “band of brothers” in Sacred Bridge, Rano have worked directly on the field, bridging communities, faiths, ethnicities, and people of all ages together in the hope of cultivating mutual understanding and respect – fundamental values which are rapidly diminishing in today’s world. Very much in line with his conscience and quest for knowledge, one thing that Serrano have always shared is to never stop learning – especially from mistakes. Until his last days of battling his illness, Rano kept reminding us – the younger generation of Sacred Bridge – to always celebrate life with joy. 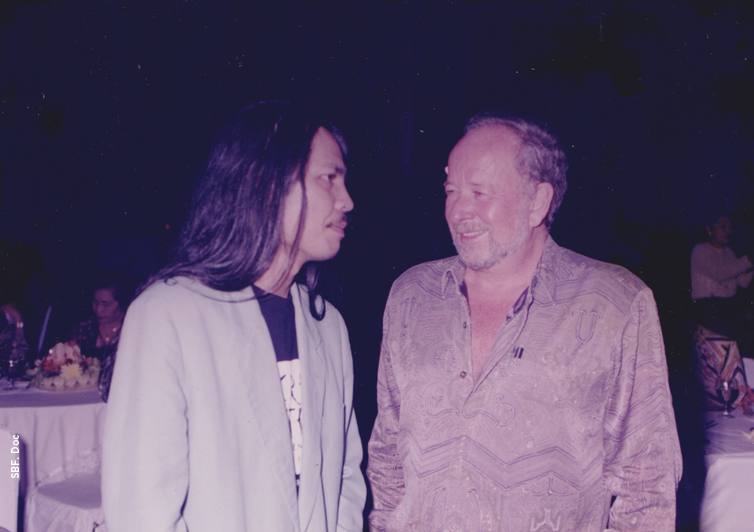 [Left] At the “Sacred Rhythm: The Millenial Percussion for Unison” Festival, 1999-2000, Bali. 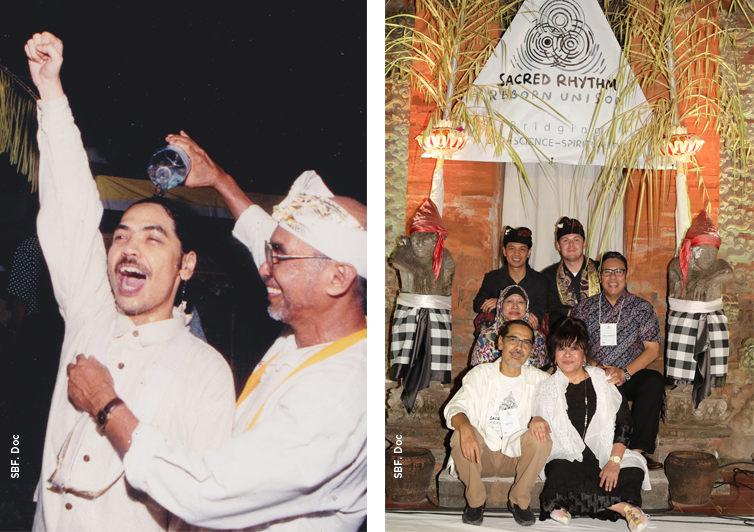 [Right] At the opening event of “Sacred Rhythm: Reborn Unison”, 2018, Bali. Below is a eulogy from one of Rano’s “brothers” which beautifully portray who Serrano Gara Sianturi was. Rano Sianturi was my brother. Not, perhaps in blood. But in spirit and soul. I am so sad that he passed away so early. He had so much more to contribute to this earth and our humanity. I knew Rano originally through working together to create and then develop his masterpiece of life, the Sacred Bridge Foundation. Rano was the inspiration and the man who made it happen. I, for my part, could see, and brought in the United Nations, and UNESCO to help make his vision a reality. Way back – in the second part of the 1990s. We worked with kids and young people caught in conflict – across religious lines, in street gangs, and most importantly of all, with the traumatised children of the Aceh Tsunami. 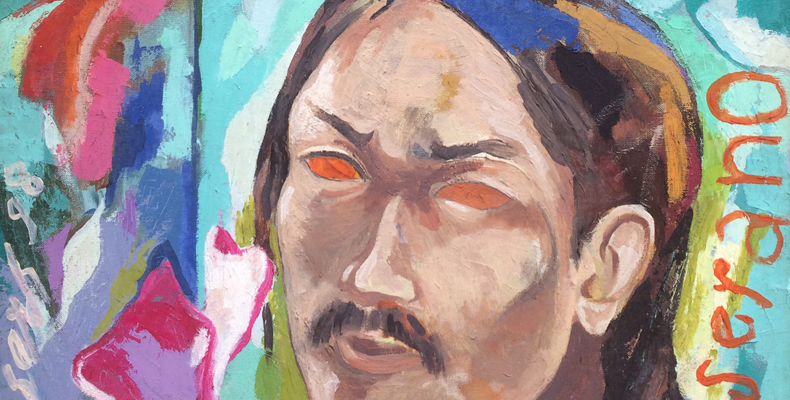 Using music and performance, art and culture, creativity – to heal! To fend off the worst diseases of economic greed and fight for the quality of our world, our environment. But I was privileged to get to know Rano so much more. As my very close friend, my inspiration of what humanity is and can be … my honoured brother. I loved him dearly. We never lost touch. Rano brought Stomu Yamash’ta and me together in Bali back in 2012 – long after I had retired from my United Nations responsibilities. Originally to help create an international culture centre – but based within the indigenous community – representing and learning from the deep-time history of our humanity rather than just its present surface. This vision of Rano’s is yet to be achieved. But what was achieved is the stimulus to create a movement based in our spirituality and connectedness to confront the greed and inhumanity of contemporary global economics – “The Kyoto Manifesto for Global Economics” which took shape over four years, was published last year, and is now forging a link with the emerging “Circular Economy Movement” from the European Union – ultimately, together, conserving and recycling everything possible in our use of the earth’s resources rather than exploiting it for greed and short term profit and advantage. Basing the philosophy and practice of human relations and exchange within the deepest reaches of our true and shared humanity – rather than greed and immediate competitive advantage, the shallowest of what our humanity can be. Rano was there before the rest of us. Our inspiration. Our guide. Rano was – and is – a truly great human being. An inspiration to us all – from the compassion which was his heart, and the wisdom which was his soul. I loved Rano deeply. He loved all humanity. The world is so much a better place for all of us because Rano walked amongst us and inspired us to be so much better. On the 3rd day after Rano’s departure, Ven Dr. Juewei Shi, Director of the Research and Teaching Institute at the Nan Tien Buddhist Institute and Temple in Wollongong lit a special candle and offered a prayer alongside one of our founders, Stephen Hill who is currently a senior for their teaching and research programs, demonstrating his debt of gratitude and inspiration – and a close friendship. Rano, Rest in the Peace You Deserve. The Peace of Love – the guiding light of your life! The discussion between meat-eater and vegetarian/veganism (we know the differences, don’t worry) in terms of food regarding animal rights and/ or environment is a never-ending debate. But there’s an alternative argument that differs from both mentioned above. 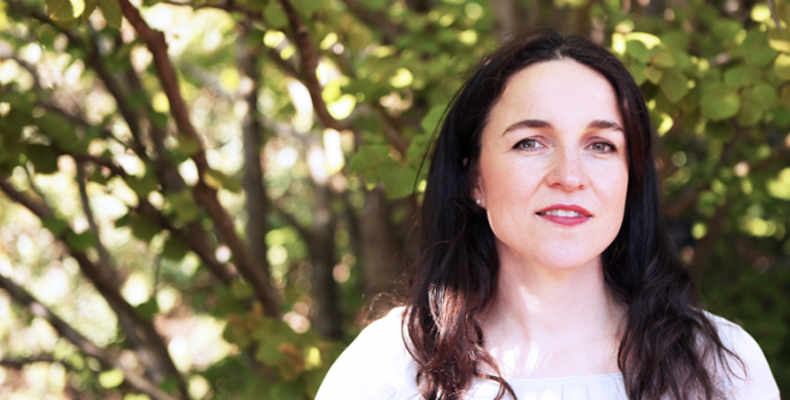 Louise Gray is a meat-eater; but instead of eating meat from factory, she only eats meat from animals she kills herself, underlining the importance of living closer to nature and working hard to get what we need. Let’s call her lifestyle ethical carnivore. You can find her interview below, but before that let’s discuss a bit more about the issue. What vegetarians and ethical carnivores do is morally attempt indeed, yet they’re not the solutions we need. To challenge both arguments, it’s necessary if we first define what it is to be living things. In biology, an organism that reproduces, grows, and need food is a living thing. Our cells do reproduce, grow, and need food (called Phagocytosis). Thus, if cells are living things, then everything we eat are also living things (including vegetation); making it unavoidable for us to eat without killing; that is unless vegetarians and/ or ethical carnivores have a different definition regarding the living things. Second, let’s define food. Human has food preferences; edible and also delectable – doesn’t matter either it’s vegetation or meat. Therefore, in the long run we won’t be able to avoid the exploitation of specific natural resources that will lead to imbalance in nature. On the other hand, as a whole, animals and vegetation don’t have food preferences. They eat everything and anything, a food chain. That’s why, in nature animals and vegetation –unless disturbed – don’t overpopulate. This is how Sacred Bridge Foundation sees the issue regarding what to eat. How about you? Organic, Humane, Animal Welfare Approved, Certified Sustainable, Free Range — there are as many food labels today as there are ways to skin a cat. And yet, can we be sure that as we wipe the plate after seared scallops we are not wiping the ocean floor of its plants and corals? What sleight of hand really distinguishes humane from cruel? And how much deforested land does it take to make a steak? Over a course of two years adhering to her inconvenient diet, she dispatched, among others, 12 mussels, six American signal crayfish, 12 mackerel, a pollock, three pheasants, three rabbits, a sheep, a squirrel, and a red deer. At risk of being branded an atavistic and unnecessary exploration of how we as humans gather our food in the modern age, Gray’s travels took her across the U.K. to dissect the ethical and environmental quandaries of factory-farmed meat. She also sought an understanding of those still in search of wild quarry. Along the way, she discovered the hunting organizations in pursuit of conservation; she ate roadkill; and she broke the lesser-known secret about Sir Peter Scott, founding father of the World Wide Fund for Nature (WWF), whose passion for protecting the environment was born out of a love of shooting wildfowl. Mongabay recently talked with Gray about her unusual year, the paradox of being a hunter who cares about animal welfare, and her new adventures in service to the humble vegetable. 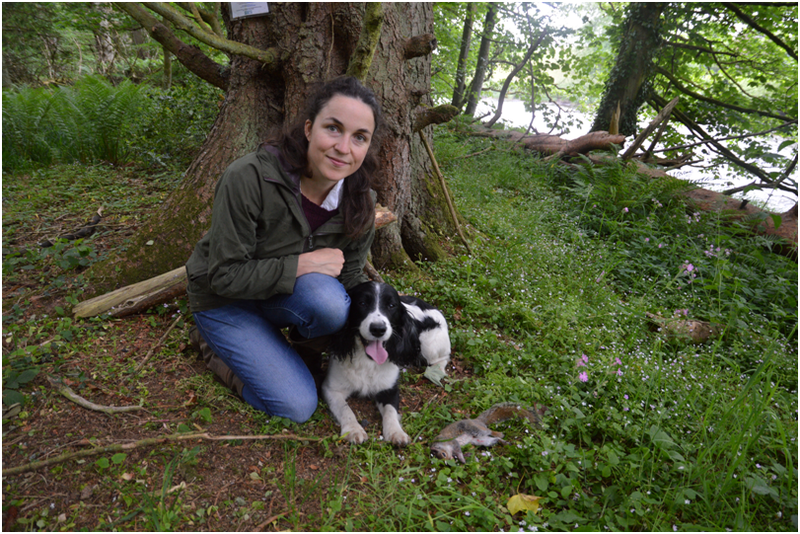 Louise Gray, with dog, after making her first squirrel kill. “The Scottish Wildlife Trust is controlling the population of grey squirrels in Dumfries and Galloway to stop the animals taking over the habitat where reds also live,” writes Louise in a blogpost. Image by Louise Gray. Mongabay: Where did the idea for “The Ethical Carnivore: My Year Killing to Eat” come from? Louise Gray: I was working as the environment correspondent for the Daily Telegraph, and I was writing about climate change every day. I knew what a serious situation we’re in — it’s pretty scary — so I wanted to do my bit and reduce my footprint. I knew the easiest thing I could do is to stop eating meat. But then, I often come to the countryside and meet people who raise animals. I thought that was ethical meat, and I didn’t have a problem with it. So I thought, well, if I only want to eat that kind of meat I really have to understand where it’s com[ing] from. So, I’m only going to eat animals I kill myself. I understand that you grew up on a farm. What was your relationship to meat-eating at a young age? I didn’t really think about it, to be honest, because it was just a part of our life and our culture. We ate meat. I was always really interested in animal welfare, and was a RSPCA [Royal Society for the Prevention of Cruelty to Animals] Junior member. I understood meat as being eaten by humans, and I took it for granted as a child. It was only really when I became an adult that I started to question that. This is one of the interesting points, almost dilemmas, at the heart of the book: you’re somebody who cares for animal welfare, cares for the planet. But there will be environmentalists who might see your decision to kill animals yourself as, perhaps, unnecessary. Yes. That’s where the book started from — if I were an environmentalist I ought not to eat any meat. I say all throughout the book that, if you want to have a light footprint, the easiest thing you can do is be vegan. But my job as a journalist is to fully investigate things. [Veganism] didn’t answer my questions about how the landscape of Britain is managed, about marginal areas where nothing else can be grown. I suppose it was also a philosophical question, because I didn’t think that people who ate meat were necessarily bad people. In the book, there’s this chap Steve who teaches you to hunt your first rabbit. He’s a seasoned gamekeeper; he’s been doing this his whole life. To somebody standing on the sidelines they might think, “Well, this guy must just not really care about animals.” But you go looking for a lost rabbit you shot, and when you bring it to him later at the pub, he starts to cry. To say he doesn’t care, I’d find that preposterous about someone like Steve who spends all day outside managing animals. For someone sitting in an office, who can afford to go and eat vegan protein every day, to criticize someone like Steve — I just don’t see that as a good reflection of reality. I think that Steve is really connected with wildlife; he’s just doing it in a different way. We’re interacting [with nature] all the time. If you think you have a perfect relationship with it, where you don’t have any impact, well you’re only having a lighter one — you’re still a human on this Earth. At one point in the book you write of the U.K.: “If anyone can save the salmon, it’s the anglers.” What brings you to this conclusion? There’s a [U.K.] charity called the Angling Trust, which does an enormous amount of work. Like if there’s pollution in the river, they will chase the Environment Agency and make sure that people are fined. The fishermen are watching the river and understanding it. Salmon fishermen don’t take meat anymore — they haven’t for a long time. They’re really there to enjoy it and preserve the rivers. I think it’s a very clear example of the hunter protecting the hunted. Editor’s note: The Angling Trust has encouraged the catch and release of wild salmon; the U.K. Environment Agency reported that anglers released 79 percent of caught salmon in 2015. 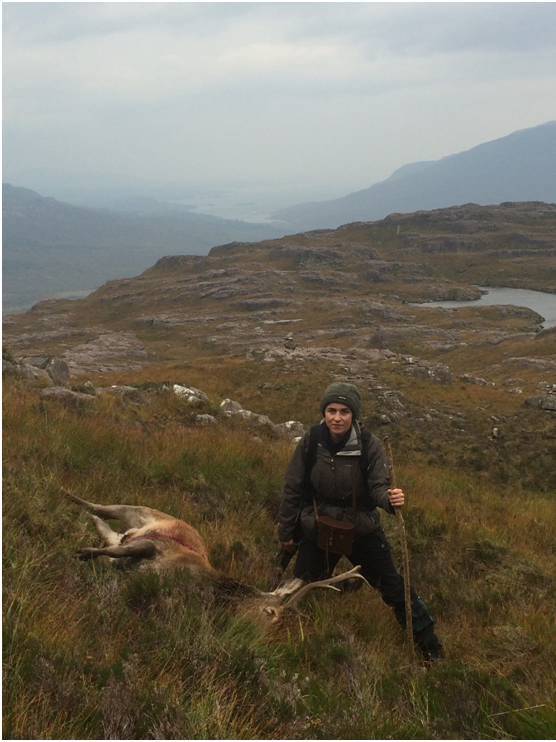 Author Louise Gray, with her first deer kill in the Scottish Highlands. She writes: “Although red deer are a native species, they would never usually have existed in such high numbers. Tree regeneration is suffering as a result of their browsing.” Image by Louise Gray. There’s quite a tradition in England of gamekeeping. You mention certain reports in the book — one was “The Value of Shooting,” and the other “The Code of Good Shooting Practice” — and you talk about how they bring money into conservation and also encourage the reporting of poorly managed estates. How does this compare to angling? You know what, I would say that, unlike angling, pheasant shooting is manufactured. People put the birds down [import them for release on an estate]. The British Association for Shooting and Conservation and others do try to make sure that the sport doesn’t have a big impact [on] the landscape. But, actually, since I’ve written the book it’s becoming clear that a lot of estates and farms aren’t keeping to [guidelines]. It is a problem in the U.K. A big problem. There are too many pheasants, and it’s not good for wildlife. I always knew that [gamekeeping] was a difficult thing to bring into the book. I wanted to investigate it because I find it quite interesting socially and culturally. But I do see it as problematic for conservation. Obviously, he’s done a huge amount — he set up the WWF. But not a lot of people know about the WWT, and that organization does a huge amount as well not only in the U.K., where it looks after lands where wading birds live, but also in countries like China where they’re helping to bring wetlands back to life. He set up two very powerful charities, which continue to do a lot [for conservation] today. He inspired a lot of people — he was a huge inspiration for David Attenborough. His own past as a keen wildfowler … I think he loved being out in that environment, and perhaps as a young man he loved the shooting. But ultimately he loved the environment most, and he stopped the wildfowling in his later life because he realized that there wasn’t enough [wildfowl] for him to continue doing it. I do think what’s really interesting about it for conservation nowadays is how Sir Peter Scott isn’t celebrated, or it’s not mentioned, concerning his link with wildfowling. There’s quite an absolute line between conservation organizations and organizations where people are hunting and shooting and fishing. A lot of [hunters] are really involved in the landscape, and not just in England, but all around the world. There are developing countries where people still live off the land, and meat is how they interact with animals as a part of their life, and a part of conservation. I think it’s really important to talk about it. A lot of people living in cities have this lovely idea of nature [but forget] we’re a part of nature. We’re in it. And we have to admit that when we’re thinking about how we can better protect it. If it’s not eating meat where you draw an environmental line in the sand, where then is that line? I’m afraid the line isn’t that clear cut. I would say buy high welfare meat, and don’t eat a lot of meat, but I can’t say there is a certain label on food that can guarantee all your meat comes from an animal that has a pleasant, happy life. There are risks involved in eating meat, and I think you have to face up to that. I think that knowledge is where I draw the line. You have to have knowledge about what you’re eating. It makes people eat a lot less meat naturally — and it lasts. I’ve read you are working on a new book about the ethics of fruit and vegetable cultivation. Are you only eating things you harvest yourself? Nice idea, but I would starve! I am growing my own vegetables in an allotment as part of my exploration of the ethics of fruits and vegetables. But I am an amateur gardener, so it is merely to feed into the story and to learn about horticulture. The focus of my exploration is again going to be where the fruit and veg comes from that we buy in the supermarket, as I feel that is most important. If we look at article 263 section (1), a person who publicly insults the President or Vice President will be sentenced to jail with a maximum of 5 (five) years or pay a fee. The bill sparked criticism, dubbed controversial by some, because it limits people’s freedom to express and criticize in the democratic nation. As reported by Kompas.com, the Chief of Institute for Criminal Justice Reform (ICJR), Erasmus Napitupulu said the bill must be erased because it could be utilized as a repression tool by the government. Andreas Marbun as Head Division of Legal Policy in Indonesian People’s Court Watch from University of Indonesia writes in Tempo.co, arguing that the bill is opposed to the nation’s constitution. It seemingly revives the Dutch Indies colonial law which then sent one of Indonesian founding fathers, Ki Hajar Dewantara into prison for writing a critical script and published in De Express newspaper titled Jika Saya Seorang Belanda (If I Were A Dutchman). “Penghinaan,” or insult in English, is written in the bill. To know the meaning is the first path to understanding; being able to separate between insult and criticism is a must, if one wishes to avoid misconception. In the dictionary, insult means to treat with insolence, indignity, or contempt; it can also mean to affect offensively or damagingly – without responsibility and often irrelevancy. Discordantly, criticize means to consider the merits and demerits of and judge accordingly; indicate the act of finding or pointing out the faults. It also needs to be well pondered, in a wider term, that criticism is in the domain of self-awareness that gazes and evaluates one’s personal viewpoint. With this process, criticism brings constructive value and also elevate people’s consciousness to improve not others, but themselves first. The two differ in definition; if insult can be seen a destructive offense, to criticize is to give a constructive fact-based judgment. Regarding the bill, ideally it would only prosecute those who insult the executive leaders of the nation. The emphasis on “insult” is written on the bill and the word “criticize” is nowhere to be found. Concerns arise when there is no definite meaning of insult in the bill and no explanation of what constitute as an insult and what does not. A clear line of separation for both concepts must first be concluded by the government and must be clear in the bill. In reality, a separation of insult and criticism are not as simple as what the dictionary can define. Insult could also contain truth and facts, making it as a criticism with harsher delivery in some terms such as intonation and chosen words. Sometimes it can also be hurtful and even hostile when someone makes these fact-based insults to others — blurring and seemingly combining both definitions. The freedom to insult Presidents and governments do happen in other democratic countries. One perfect example would be The United States of America which protect and enact freedom of speech in The First Amendment of their constitution, a consensus that make ways for voices to be delivered; from criticism, insults, nonsense, and some combinations of the three. Donald Trump as the current President of USA would know this. Insults have been made since he announced his bid for presidency and have gotten worse since he was voted and crowned as Uncle Sam’s number one man. From fact-based criticism to pure insults, it keeps coming in and no law could interfere those who taunt and heckle the nation’s leader. In the context of Indonesia, separating what is criticism and what is insult must be made as clear as possible. Aside from the consensus that the government made, it is also important for the people to agree on the same definition with them or each other — A consensus from parties to shape and define which is which. Whether Indonesia need a law that bans insult is necessary or not is up for debate. But the main question is, can a consensus be made with the agreement of all parties in Indonesia? In Ben Arous, Tunisia, Tarek-el Tayeb Mohamed Bouazizi stood in front of the local governor’s office after a policewoman confiscated his fruit cart and also gave him a beating. What came next was a phenomenon that startled the world; igniting revolution and the will of social change. Bouazizi covered himself in fuel and lit a match, burned himself alive on December 17, 2010. The 26 year old was one of the street vendors that had to pay 3 dinars of extortion everyday to sell his goods; a “lucky” one compared to many who are jobless. On the day he committed suicide, Bouazizi could not bribe the authorities that then led to a conflict that costed him his earning. On January 4, 2011, the Sidi Bouzid born man finally died in Ben Arous Burn and Trauma Centre — 18 days after his suicide attempt. Desperation came after the authority rejected the demand in getting his belongings back. With much dismay, the effect was powerful. The self immolation of Bouazizi triggered revolution that eventually created the Arab Spring in the Middle East. It all started in Tunisia when the 23 year rule of President Zile El Abidine Ben Ali finally ended after massive protests and even violent riots. When the unrest broke out government responded with stick and carrot approach, ranging from repression, arrests, internet shutdown to massive job offers. It was too late, and the Tunisian Revolution went out on a full scale when protests and violence continued. On 14 January 2011, Ben Ali and his family fled to Saudi Arabia — marked the assurance of the government overthrow. Such revolution generated the domino effect of uprisings across the region, started from Egypt, Algeria, Libya, Syria, Morocco to Mauritania. It was inconceivable that the Arab Spring was precipitated by a street vendor who burned himself alive. Suicide has its reasons; from illness, philosophical choice, to an atonement of honor like what I have mentioned before in Sword to the Stomach: Seppuku and the Case of Altruistic Suicide. Self immolation can’t be pinned down to one reason, because it differs from one persons motive to another. While seppuku came from a long line of history and culture, the act of burning yourself alive doesn’t have any established rule. So what are the causes that made a person willingly burn himself or herself to death? Truth be told, the martyr didn’t even know what his action would bring to Tunisia and beyond. When setting himself ablaze; Bouazizi was in desperation. What we can found out in stories, interviews, or eyewitness testimony leads to one particular reason that is economy. As a backbone who provides for his big family, Bouazizi’s frustration can be seen as an exit or a bold protest that goes to the point of no return. It is safe to say that the simple fruit seller burned himself without an agenda to overthrow the government. The economic reason of a man who kills himself triggers the climax for the nation’s social inequality, a catalyst of revolution with no political intention whatsoever — an accidental martyr. There are cases where people willingly lit themselves on fire to make a political statement. A perfect example would be Thích Quảng Đức, a Vietnamese Buddhist monk who burned himself alive in the intersection of Saigon, Vietnam. The year was 1963 when Quảng Đức gave his protest against the persecution of Buddhist by the Catholic Diem regime in 1963. The self immolation was later immortalized by a powerful photo of the burning monk who sits peacefully. Self-immolation with social and political reasoning happens throughout the modern age. After Quảng Đức thought provoking protest, there are those who imitate his way to deliver a political message. Norman Morisson from Pennsylvania, U. S., burned himself in 1965 to protest the Vietnam War and Jan Palach from Prague, Czezhcoslovakia set himself ablaze in 1968 to protest the invasion of Soviet Union. What made Bouazizi different is his motives. Although he represented the Tunisian people, and did not plan anything, the fruit seller changed the social political climate indirectly. The other self-immolating individuals mentioned above had political motives right from the start, thus separating Bouazizi’s act from political “sacrifice”. To some extent, Bouazizi act of self-immolation can be explained by Emile Durkheim theory of suicide. There are four causes of suicide in the sociologist viewpoint; egoistic that comes from a lack of belonging within a community, altruistic that happens because of highly socialized individuals and value the needs of community, anomic that lacks the regulation of individual in society, and fatalistic that position individuals in excessive moral regulation by society. With these definitions, we can conclude that the cause of self-immolation can relate to altruistic and fatalistic suicide. In Bouazizi case, fatalistic describes it well. This type of suicide happens because of oppression, placing the policewoman and Tunisian government as the oppressor. Excessive regulation leads to a choice that ends in flames for the simple man. Some self-immolation cases can be altruistic if they are fully aware of what they do carry a good cause they truly believe in that also happens to be the concern of society; a social or political role that eventually benefit others. The aforementioned three self-immolation event in the sixties can be concluded as altruistic suicide since the three men took a conscious decision that will cost his own life in the name of other people well being. What Durkheim didn’t explain is the aftermath of a suicide. Although Bouazizi’s reason behind his fatalistic suicide was a way to escape, what happens after he died was arguably the effect of an altruistic suicide. An accidental sacrifice that connects with the people through representation of frustration — a combination of both when the oppressed shared the same fate and connects in the altruistic ideals. Tunisia has a majority of Muslim population that reach 99 percent including Mohamed Bouazizi, a man with a name taken from the prophet Muhammad. Although suicide is condemned in Islam, his act did not harm anyone in the process. He visually stunned people with violence at its worst, causing hysteria and provoking minds without physically hurting others. In contrast, there are people or groups who justify suicide bombing in the name of religion, hurting and killing people. According to Chicago Project on Security & Threats, there are about 5,430 suicide bombing attacks that kill 55,022 people since 1982 to 2016. In the Islamic viewpoint, self-immolation and suicide attack are a fallacy that goes against the core values of religion. Cheating death is a sin and both phenomenon started with a will to kill themselves. But when we look to the external world, it differs significantly. One limits the agonizing death to his or herself and the other takes along casualties — terrorizing and inflicting fear. Self-immolation can be complex, it’s a self inflicting violent suicide that has multiple purpose depending on the one who execute it. If we dissect the word origin, “immolation” originally meant sacrifice. Later on, the definition added the role of fire. In Merriam-Webster dictionary, self-immolation is defined as a deliberate and willing sacrifice of oneself often by fire. The “sacrifice” that burns violent flames gets passed on from generation to generation with its own purpose. From Hindu customs such as sati that made widows burn themselves in her husband funeral pyre, Russian orthodox known as Soshigateli that enact “fire baptism”, monks that protest by self-immolation, to Bouazizi that lit a fire in desperation. Bouazizi self-immolation is a reenactment of past practices like Quảng Đức did in the sixties that spark other protests, and a 49 year old restaurant owner Abdel-Moneim Jaafar who burned himself before the Egyptian Parliament in January 28, 2011 that led to Hosni Mubarak’s resignation. A second coming spreads from the Middle East that include the same act by Mohsen Bouterfif, Maamir Lotfi, and Abdelhafid Boudechicha in Tunisia. Sadly enough, however, the following events do not have the powerful effect as the “first” ones, in fact, most ended up as the anti-climax. There are still voices unheard. In Indonesia, Sondang Hutagalung committed suicide by self-immolation as a protest to President Susilo Bambang Yudhoyono government. The 22 year old law school student was reportedly disappointed by the human rights violation and wanted a change. On 7 December, 2011 Sondang burned himself in front of the Presidential Palace and died three days after. Unlike Tunisia, Indonesia stayed the same without significant change. 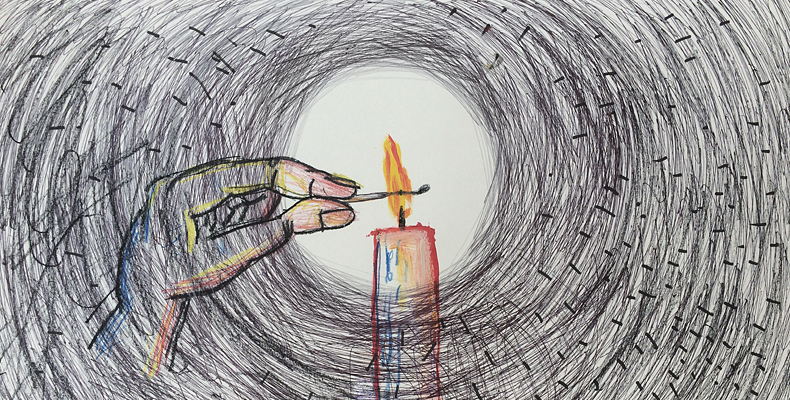 When burning yourself won’t change anything, what does it take to be heard?